"A sense of honour in the South Seas is as about as silly as a silk hat in a hurricane" says Dr Kersaint to M. De Laage, the tyrannical governor of Manikura, a French colony in the South Pacific, who is "under the spell of honour and duty" and defines honour as the need to impose control on feckless natives. A ship arrives, bringing Mme De Laage, and Terangi, the First Mate, a born sailor who "kept hanging from the mast like a bird, with wings stretched for home". The natives rush cheerfully aboard the ship to welcome the crew home, to the strains of Aloha Oe (read more about that song here). The natives, as the Doctor says, "are like birds who need to flock together in the breeze" The village celebrates the wedding of Terangi and Marama. Great shots of native girls in leis and Terangi's muscular bare chest. Terangi and Marama set off in a dugout for an island honeymoon. But Terangi smells a good wind: the ship sets sails again. In Tahiti, Ternagi and his friends are in a bar with loose women who smoke. Terangi plays with a mechanical hula doll with childish delight. "Get up when a white man tells you!" sneers a drunk. Ternagi fells him with one blow. But in colonies, fighting back is insurrection. The Hurricane's subtext was dangerous. Setting the movie in a French colony disguised the fact that the same brutal rules applied elsewhere, including Hawaii. Or in the mainland US, for that matter. Terangi is imprisoned. Being a free spirit, he keeps escaping and his sentence gets extended. "Sixteen years in a cell with rats as companions".in chains, being whipped, doing hard labour., but Terangi remains unbroken. He escapes again from maximum security, but inadvertently kills a guard. He steals a canoe and paddles 600 miles back to Manakura, navigating by the winds, braving storms at sea. The local Priest takes him in secrecy to an island, where he's reunited with Marama and their child. Back in Manakura, a hurricane is building up. "Imagine Paris", says Mme De Laage, "civilizations don't do well in a hurricane" The natives are restless : they know something, they're smiling. Terangi's a legend, a symbol of freedom. De Laage finds out where he's hidden and sets off to capture him. "You'll find a stronger authority than me in that storm!" cries the Priest. The hurricane hits Manakura. People take shelter in the church, whose bells won't stop ringing in the wind. Fabulous cinematography - sheets of rain, flying debris, palm trees crashing, pounding waves. I've been in hurricanes. When I first saw this film on TV, it seemed realistic enough (to a kid). Terangi appears in a boat and the priest tells him to save those he can, who include Mme De Laage. Eventually the church bell falls silent. But by then the church has been flattened, the priest and most of his parishioners killed. Terangi and his family wash up on a beach and light a fire. M. De Laage comes and rescues his wife. Terangi and his family escape in a war canoe. De Laage spots it in the distance from his ship. "It's just debris" says his wife. 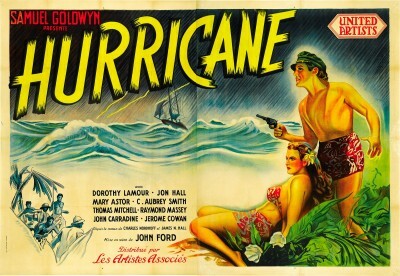 Given that The Hurricane was made in 1937, the director John Ford and producer Samuel Goldwyn really couldn't take risks with the authorities, so they probably needed to play up the pseudo-religious moralizing, which is pretty turgid. Overlook that, though, and the movie is daringly radical. It challenges racism outright, and the idea of rigid, relentless power structures. Although Ternagi and Marama are acted by white people in brownface (Jon Hall and Dorothy Lamour) and the characters they play are cardboard, the stereotypes aren't negative. 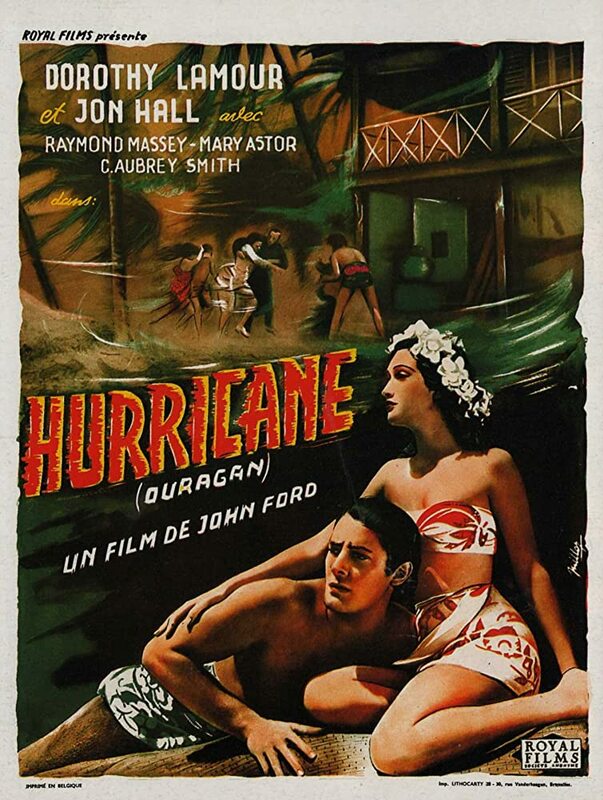 Compare The Hurricane to Typhoon, the 1940 Paramount movie shot in (then) glorious Technicolor and maximum special effects. There, the natives are no more than scenery and Dorothy Lamour's part serves only to offer glimpses of her body. Typhoon is B movie crime flick set in the tropics. The Hurricane is much more, and would have been even better had Hollywood, and the West in general, been ready for something stronger.